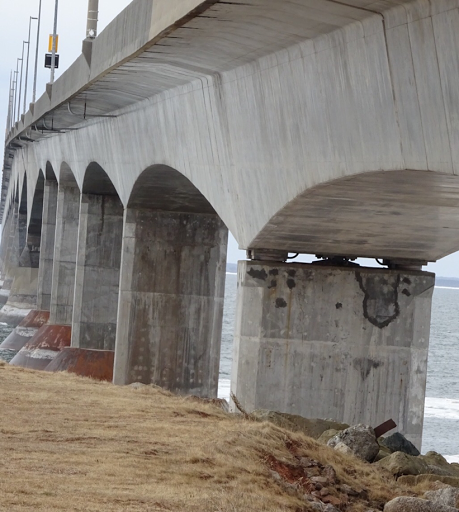 Built over four years, the Confederation Bridge over the Northumberland Strait between Prince Edward Island and New Brunswick is an engineering wonder. 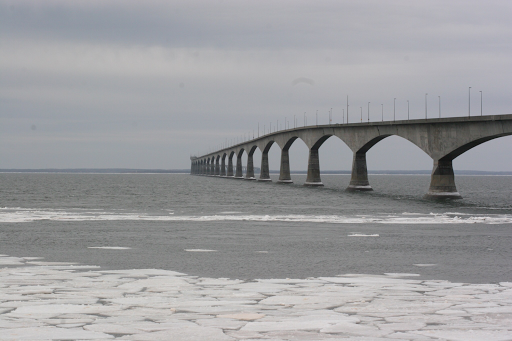 The longest bridge over ice covered waters, it covers 12.9 kilometers or 8 miles. The structure spanned time as well, taking the island from her centuries of marine dependency to a more efficiently mobile future. 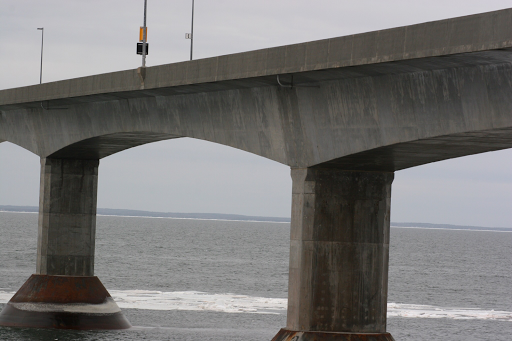 Below you can see how the concrete was reinforced with steel to create the spans and deck of the bridge. 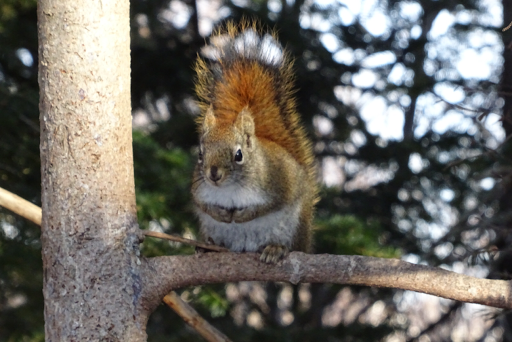 This photo is in the public domain on-line. We took lots of photos and the close-ups of the structure are impressive. 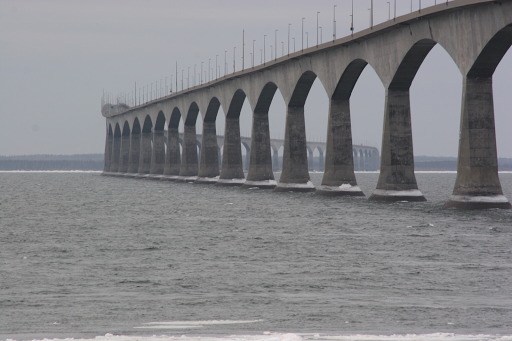 But my favourite photos show the sweep of the bridge over the Strait as it winds to the far shore. There is a toll on the bridge, as you exit the island. While many complain about this cost, it is a small price to pay for the benefits of this great structure. The Canadian Broadcasting Corporation, CBC, has a program called Canada Reads which runs for four days every year on radio and television. The program features five Canadians, each of whom champions a book by a Canadian author. The French division of the broadcaster runs the series for French language books as well. Every year, our book club members are among the many Canadians who enjoy the series featuring debate about which of the books best exemplifies a theme for the year. The winning book is judged to be one which all Canadians should read. This year's Canada Reads occurred last week with the theme Starting Over. The Illegal by Lawrence Hill. The selection of books reflects the multi-cultural nature of Canada and the breadth of literary talent in the country. The program is unique in its focus on Canadian books and has done much to promote Canadian literature in the last fifteen years on the air. It is great to hear books discussed on air and elsewhere during the series. Every year, I, along with many others, purchase or borrow and read the books featured. The winner of Canada Reads this year was The Illegal by Lawrence Hill. I am working my way through the books and enjoying them, saving The Illegal for last. 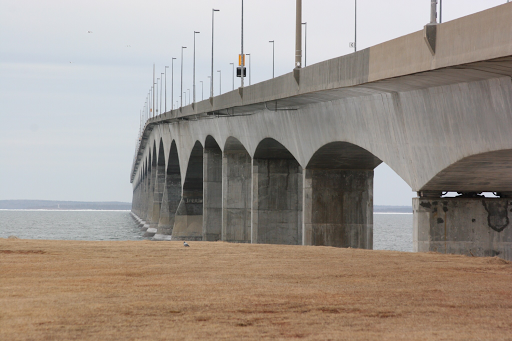 The Confederation Bridge which connects Prince Edward Island to mainland Canada is 12.9 kilometers or 8 miles long. 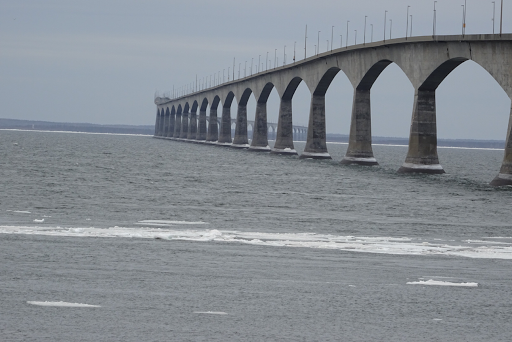 It is the longest bridge in the world over ice covered waters. 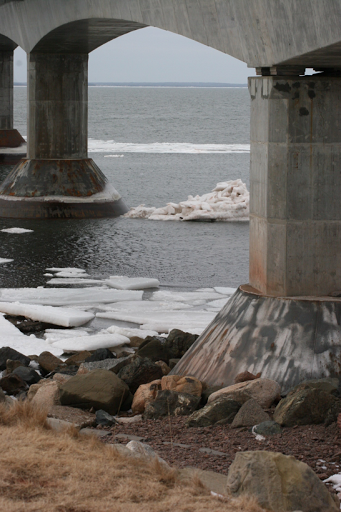 Last week, my husband, Rick and I went to Borden-Carleton to take some pictures of the bridge. 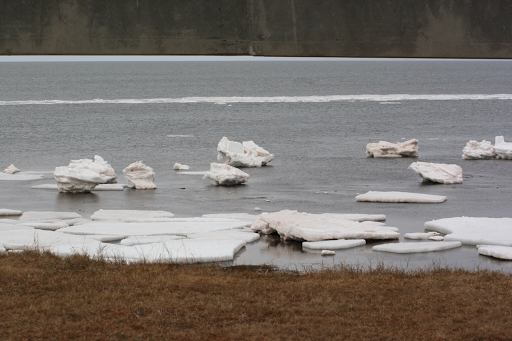 These pictures of the ice around the bridge are the first in a series of pictures we took that day. 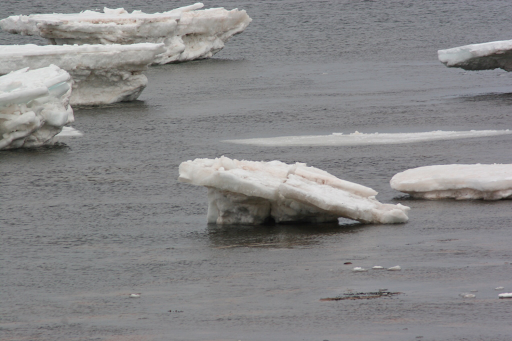 The ice in the Northumberland Strait has broken up and only remnants remained along the shoreline. 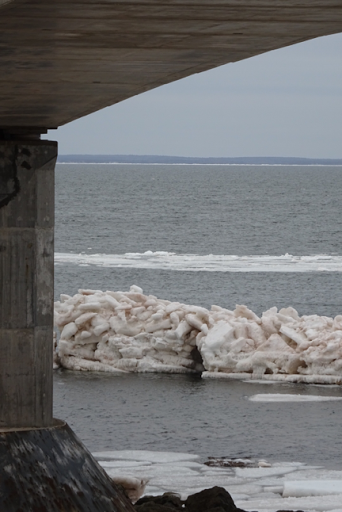 The shapes of the ice were interesting as well as the view through the spans of the bridge. New Brunswick is visible in the distance. 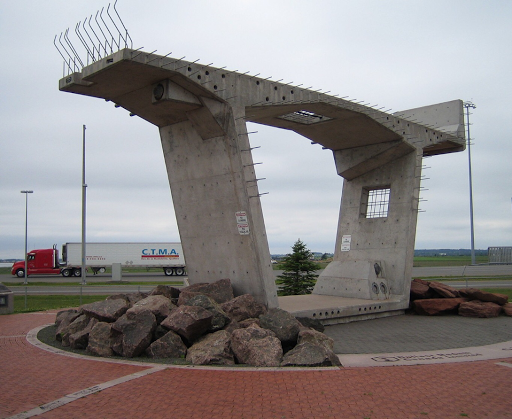 This fixed link with New Brunswick, Canada, replaced two ferries, one of which operated from this location in Prince County, on the western end of the island. Rocks deposited along the coastline prevent erosion. 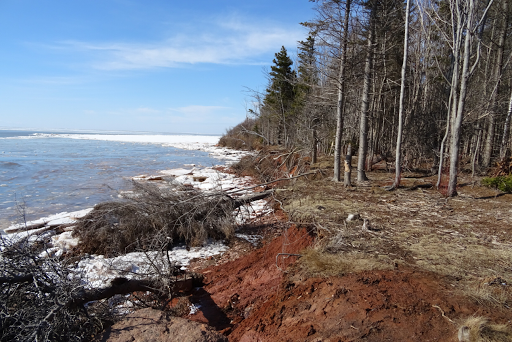 The red soil of the island is visible along the shoreline and in the ice itself. The bridge was constructed between 1993 and 1997. It changed the lives of islanders by eliminating their dependency on the ferries. 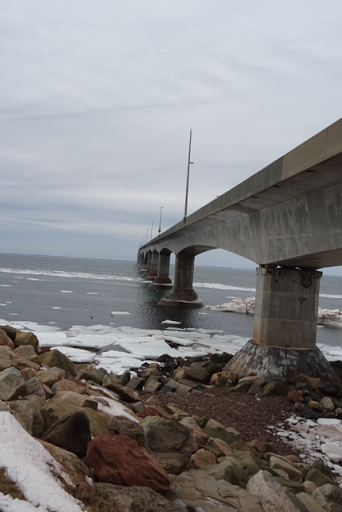 High winds cause closure of the bridge on occasion though such conditions do not continue for long periods. 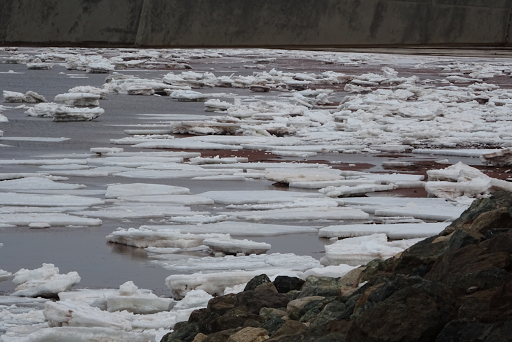 and the ice does not impede the movement of traffic. The day was cold and the wind made it uncomfortable but the scene was worth the numbing cold. When the second of my husband's maternal grandparents, Classie Lawrence Mercer died in 1994, she left my husband the family's Encyclopedia Britannica. There were two sets of books, the Junior, and the regular set plus annual updates. The Mercers had the encyclopedia for years, having purchased them from a door to door salesman. They valued the books and decided to leave them to their grandson, Rick, a teacher. In the mid 1990s, the internet was available to people and encyclopedia were no longer necessary; libraries were not using them any more. Our school libraries would not take the books because they were obsolete. We were forced to discard them. The value of the books can be understood when one considers the one room schools so common decades ago. A teacher, responsible for each subject in each grade in a school, relied on an encyclopedia to challenge the more senior students when she was busy with the others. For many young teachers, the books cost more than their yearly salaries. Thus the books were paid for over a number of years but their value was priceless. They afforded the teacher a source of knowledge at a time when such sources were few. Both of Rick's grandparents died before they knew much, if anything, about computers and the internet. However, they understood the value of education and the importance of having access to the best information available. They wanted their teacher grandson to have that knowledge, as they knew it. 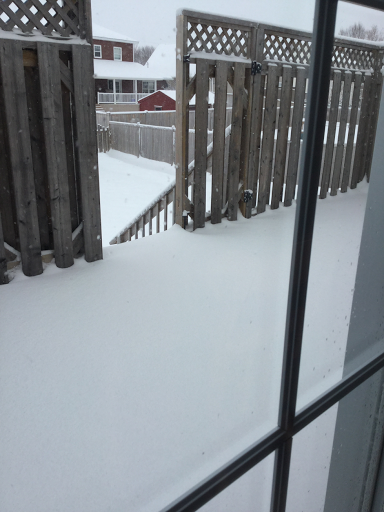 As every Newfoundlander knows, winter is not over until Sheila's Brush has swept over the land. Sheila and her brush are a part of Newfoundland folklore. She is associated with St. Patrick's Day because Sheila was connected to Patrick, such as his sister or his mother, or so the story goes. The supposed affiliation keeps the lore associated with Sheila connected to March 17th. When Sheila sweeps her brush, there is a storm on or after Saint Patrick's Day, covering the earth with snow in the last blast of winter weather. 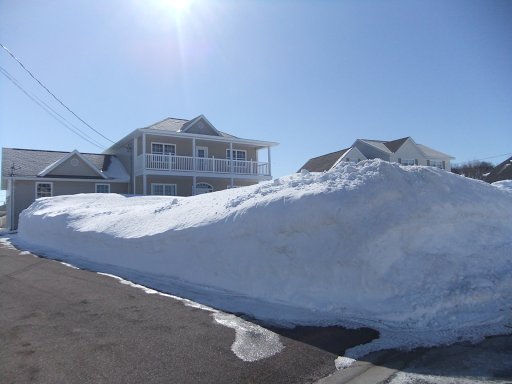 Every year, the dreaded Sheila creates a stir as people are tired of snow by this time. She is generous with her deposits and often creates a whirl with high winds. Her brush has created severe storms on occasion. When we moved to Prince Edward Island we took our folklore with us and Sheila has not relented. Last week, on St. Patrick's Day, the snow was gone. We were excited about an early spring but dreading Sheila. Then, Friday we had snow, though not a storm. Today, we will have a storm, high winds and a heavy snow fall. The mysterious Sheila has had her say again. "Don't go gettin' too excited 'bout spring," she said. "I got a bit o' snow fer ya yet." followed by a beautiful bloom which lasted a few days. The flowers are spectacular, large and showy, with vivid colours. Their prominent place in our living room, means that we enjoy every minute of the bloom. They are a source of conversation every day they exist. And each year we lament the fading flowers and look forward to the next cycle. The leaves thrive for a number of months, wither and die. Again we place the pots in a cool dark place. and we discovered another bulb sprouted off the original. We planted it separately and it grew another amaryllis the following spring. This year again, a mother bulb is generating progeny, a new bulb to give to a friend. 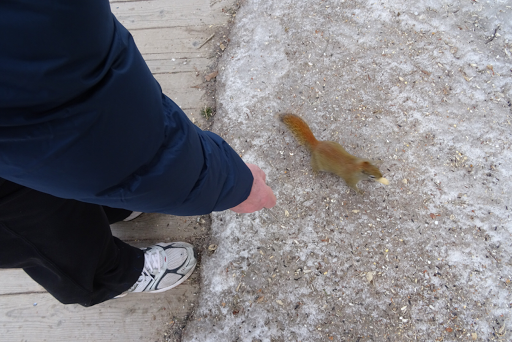 they will take food from your hand. Early walkers feed them so by midmorning, they are not too interested in food offerings. 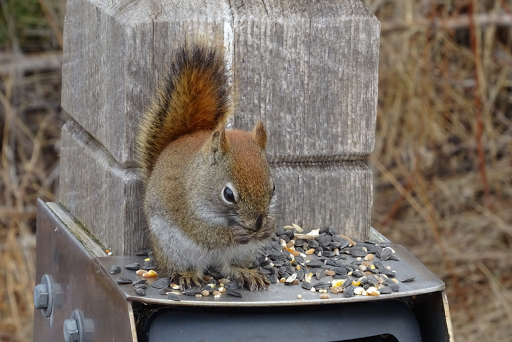 One morning last week, ten squirrels were very busy around the boardwalk but not interested in peanuts. 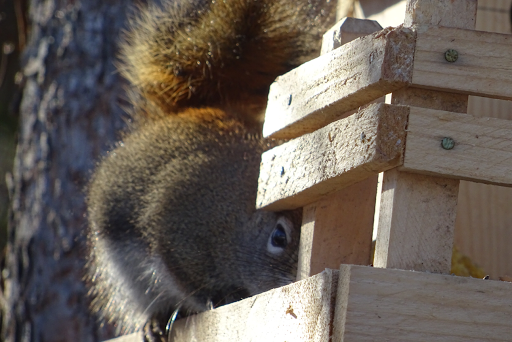 Later in the day, they were hungry again, eager to take peanuts back to their nests. 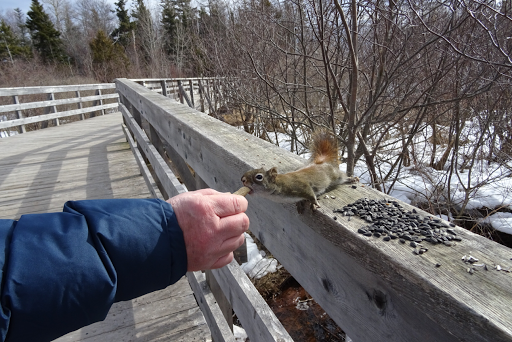 grab for peanuts, chatter and play or argue with each other. The claws are of particular interest due to their length and sharpness; they enable the sure-footedness for tree climbing. 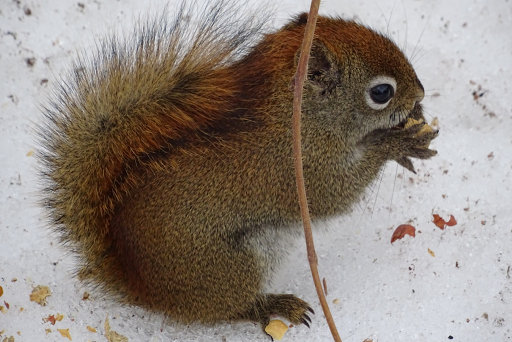 The toes, like fingers, curl around any food item, holding it in position to facilitate consumption. 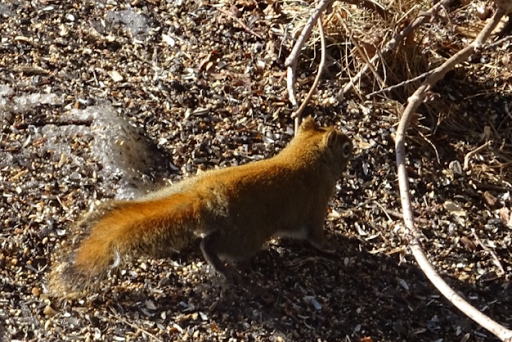 and beautiful red colouring down the centre of their backs and tails. 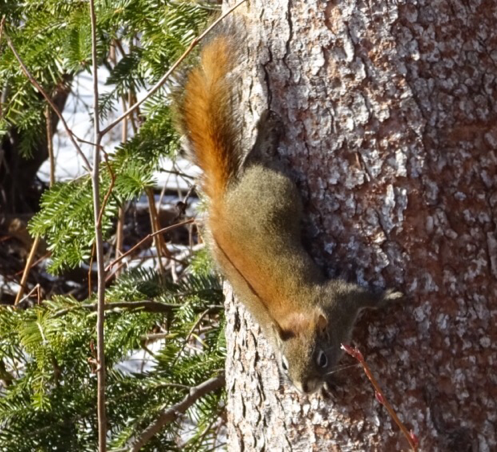 The colouring on the tail is unique in its design around the perimeter. 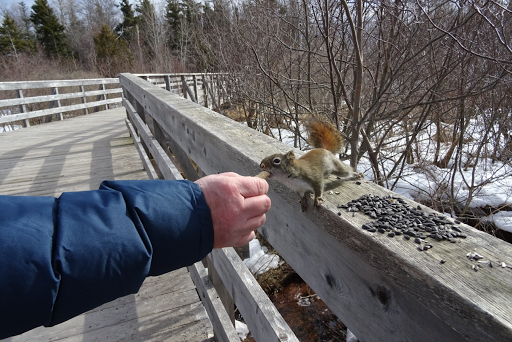 Along the boardwalk, it is difficult to see their backs; most of the time they are eating, clutching the food, sat on their haunches. 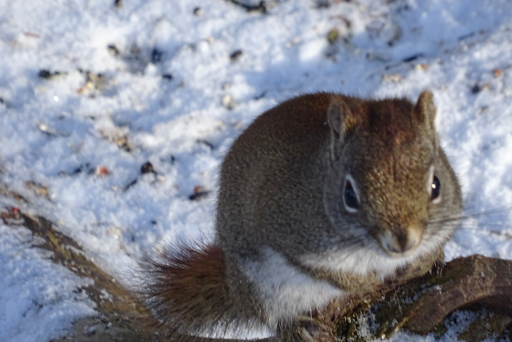 Their squirrelly movement makes them difficult to photograph otherwise. We look forward to the arrival of the young to the neighbourhood as they learn about the two legged animals who leave food for them. 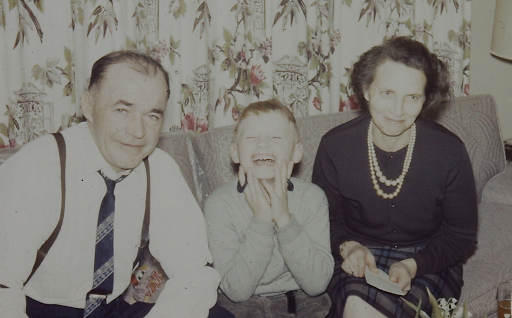 Many Newfoundlanders have Irish ancestors, including my mother's paternal family. The family names throughout the island and especially along the southern shore of the Avalon Peninsula, speak to the brave men and women who left their Irish homeland in search of a better life. Many arrived during the Great Famine, when potato blight destroyed the subsistence potato crop between 1845 and 1852. 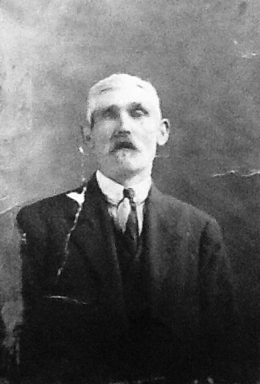 However, the Irish migrated to my homeland before and after the famine as well and such was the case for my great grandfather. My knowledge of him comes from my mother, the story teller in our family. She loved her grandfather O'Brien who lived with her family when she was young. Her memories of him became mine and with them came the desire to find out more, which has proven difficult. His name was Edward O'Brien but Mom called him Granda Brien. It is interesting that the O was omitted from O'Brien in the family's Newfoundland baptismal records. The old record books at the Archives at The Rooms in St. John's all had elaborate penmanship, but with each entry for her grandparents, the surname is Brien. 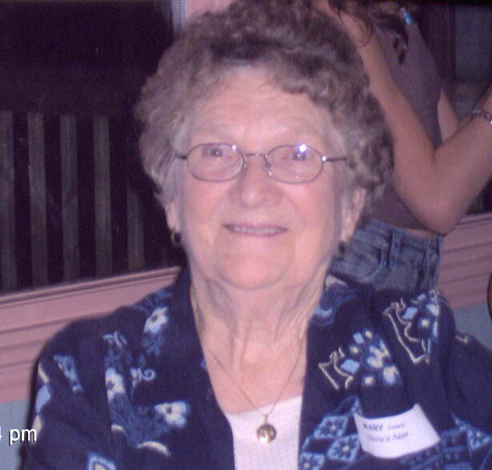 Mom had difficulty getting a passport because her own birth records showed her as Mary Brien. Edward moved to Newfoundland, possibly in the 1870s, but this is conjecture on my part. We believe his O'Brien line was not related to any other O'Briens in Newfoundland. At least that is what was told in the family. How had his family been affected by the famine? What circumstances led him to set out on his own to a new land? We will never know. In Newfoundland, Edward was a fisherman and farmer. He married Bridget Ann Kielly in Petty Harbour in 1882, and they had ten children, one of whom was my grandfather, Augustine, called Gus. They settled in Maddox Cove, a mile away, where they built a home, and had enough land to grow vegetables and graze animals. Being able to own land was important to a man who only knew tenant farming in his homeland. Something noticeable about his Newfoundland farmland was the various fields separated by a row of trees or a line of rock/stones. When my husband and I visited Ireland, one of the emotional things for me was seeing how the fields along many of the hillsides were separated the same way. Edward did the same with his land as he had known in his homeland. I discovered in census records that he was born in August 1853. However I do not know where he was born. I did ask my grandfather once and he told me, but I did not record it, so his father's birthplace is a mystery. There are stories about Edward. His namesake, my uncle, Ned, Mom's older brother was carrying on one day while Nan, my grandmother Monnie, was bent over a sack of flour in the pantry. Ned dropped something into the flour, causing it to drift upwards in a heavy cloud, covering my grandmother. When she looked up, Nan's face was white except for her eyes. She ran after Ned; he was laughing as she chased him. As they passed through the kitchen where Edward was sitting on the day bed, granda said, "Don't hurt him, Monnie. The world will treat him hard enough." Mom was there and never forgot what her grandfather said. His attitude towards children was one of kindness. Mom always spoke of how good he was to them. Another story has my great grandfather, my grandfather and two other men entering Petty Harbour in their small fishing boat during a terrible lightning storm. Returning from a fishing trip, they were in the outer part of the harbour. Edward stood up in the boat and shook his fist, saying, "Come on old man, give us yer best." The story goes that a bolt of lightning hit the boat and broke her in two, throwing the four men in the water. They were in the harbour and survived. Mom referred to her grandfather as a man of great faith. Could the experience in the boat have had anything to do with it? When he retired from fishing, he attended Mass every day and drove to Church in his horse and carriage. Edward lived to be eighty-six years old. He prayed to die saying, "I've been in this world long enough now, God. Take me home." The morning he died, in December 1939, my mother was up and ready for school. However her father sent her to the Madden's house across the cove to phone for the priest to come to her dying grandfather. In her rush to get there, Mom fell as she crossed the river on that frosty morning and her hands stuck to the ice; she tore the skin from her hands when she jumped up. Mrs. Madden bandaged Mom's hands before she went home. Her grandfather was dead before the priest arrived. 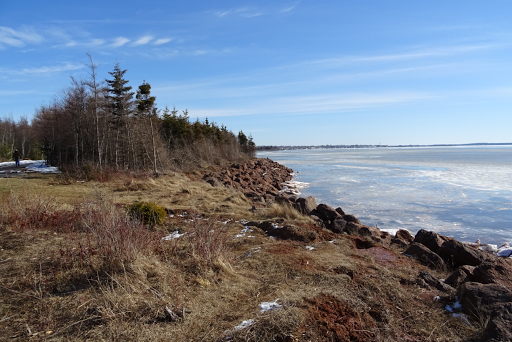 Today I live in Prince Edward Island where potatoes are vital to the economy and potato blight could be devastating. 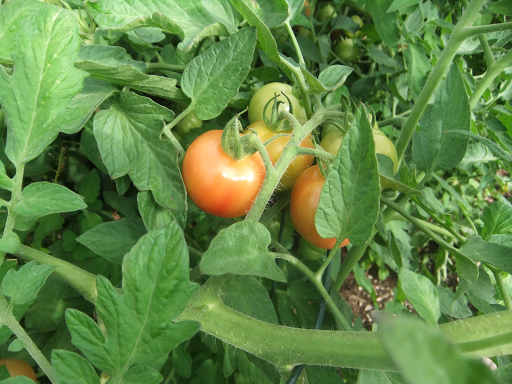 Home gardeners grow tomatoes which can have the same blight, the spores of which can be carried on the breeze to the potato fields. Last summer, our local garden center carried blight resistant tomato plants, so as to protect the local potato fields. Every time I picked the tomatoes, I thought of those Irish ancestors, lost in time, but not forgotten. Tomorrow is St. Patrick's Day. "Top o' da marnin' ta ya," she said in the Irish Newfoundland accent of the southern shore. Margie, Mary, Bernard and I were inseparable. First thing in the morning, we'd be busy. We always had a play "on the go." Our play involved getting rocks, an easy thing since we're talking about Newfoundland, and building a rock wall of a particular shape, such as a circle, with a space to allow entry. This area was the play. Here we played school, house or store. Everyone had a role, and we delighted in finding props to bring to the play. We spent endless hours there, often near my grandparents' house or near the homes of the other children. As we got older, the play became more elaborate, with rooms, and higher walls. When not at the play, we played games with the other kids, red rover, hide and seek, statues, marbles, tag, and skipping, hopscotch or jacks. Swimming in the river or at the beach was a favourite pastime as well. Plays were for the morning, swimming in the afternoon and games in the early evening in front of the old school. Margie was a great student in our school, loved shopping or working at our store and was an important part of our play family. As time went on, Mary, Bernard and I left the play and the props. What I didn't understand was that Margie had Down's Syndrome though she was just like us. It wasn't until I left the dolls and she didn't that I really understood the impact it would have on her life. That conversation with Mom was bewildering and sad. How could this be? One of my favorite teachers, Sister Matthew Byrne, from my Grade 10 year, taught history and literature. She was an actor in her own way as well, one who could make a short story or an historical event come to life with her performance in front of the classroom. My favourite memory of Sister involves the short story The Sniper by Liam O'Flaherty. Set in Ireland during the Civil War or the front of the classroom, the sniper, or a middle aged nun, was perched with a rifle, or yardstick, on a roof top in Dublin, or behind a desk. The nun's veil, lifted forward over her head, mimicked the cap worn by the sniper. How could any student forget that presentation? Over the years, I have tried numerous times to embrace the short story genre, each time without success. Some fellow book club members feel the same about short stories, finding them unfulfilling, wanting the development of characters and plot which come with a novel. 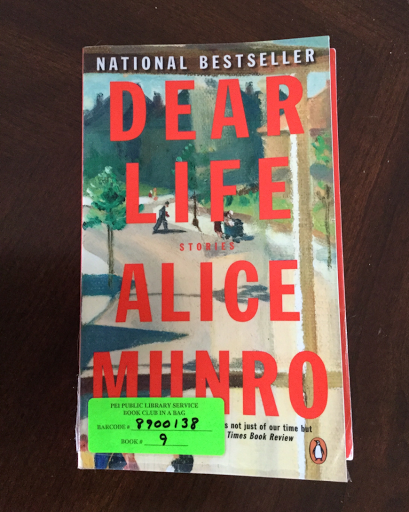 Then there is Alice Munro. Alice takes the short story to a whole other dimension in a rural Canadian setting. She is similar in age to my mother and writes of a time I know through my own life and my mother's. However, she has an economy of words, each one crafted to the story and explores life in a way which is universal. Her last collection of stories, Dear Life, has made me a fan of the genre. Munro's Nobel Prize in Literature in 2013 was well deserved. Her work is accessible to every reader, but challenges us to look beyond the story for the learning of a lifetime. After reading dear Munro, I will approach short stories differently. However, when you know the best, others may pale in comparison. It is happening much earlier than usual. Spring is usually late in eastern Canada, long after the day when the sun crosses the celestial equator, bringing more light and heat to the northern hemisphere. In our part of the world, spring is a slow starter. This year is different. 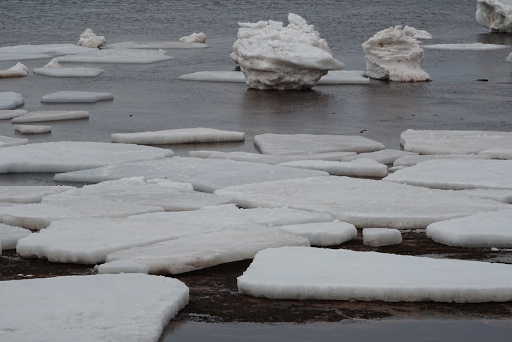 Until Monday this week there was slob ice in the harbour, a Newfoundland term for slushy or broken ice, floating as a mass in the bay. 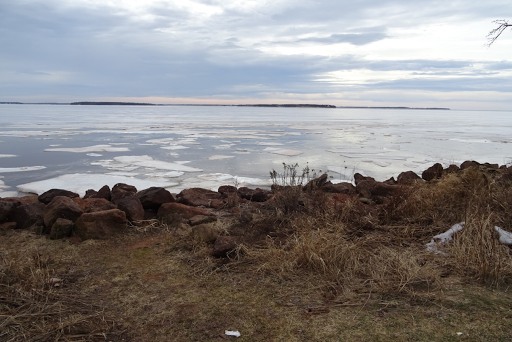 On Tuesday, with the change in wind direction, the ice was gone. Last week there was a V of geese in the sky which is also unusual for this early in March. The streams and brooks are running and the ground is thawing; the snow is almost gone. Hear the sounds of spring here. This is new territory for us. What does this mean? Will the grass turn green earlier? Will the trees begin to unfurl their leaves before the first week of June like they usually do? Will the earth be warm enough for planting earlier this year? Will there be frost as late as mid June as is often the case? Meanwhile, we are enjoying the sights and sounds of spring now, the luxury of days without snow in early March. Maybe the barbecue will find its place on the patio early this year too. For us, that will be a sure sign of spring! 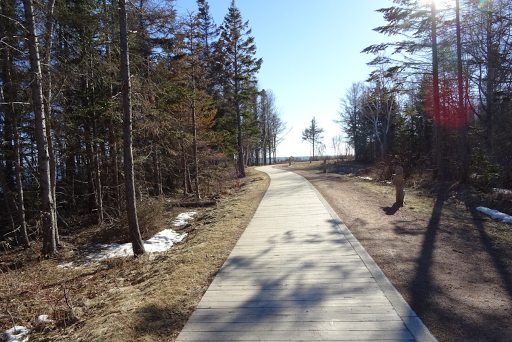 When we arrived at the end of the boardwalk one day this week, we noticed a man coming out of the trees along the shoreline, past the trail. 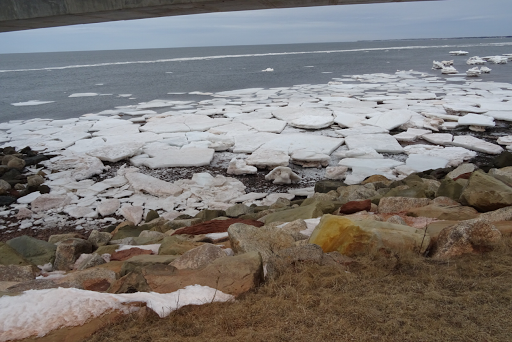 "There's a lot of erosion along there this winter," he said, pointing along the shoreline beyond the boardwalk. "In that short stretch, there are twelve trees which have fallen onto the beach." Looking at the area, the damage was obvious. The red soil, typical of the island, was visible along the shore. Trees had collapsed onto the beach from above. The shoreline which extends the length of the boardwalk into the city, is lined with armour stone, which has reduced erosion. 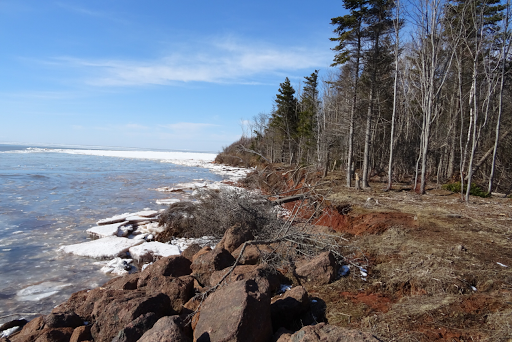 You can see the difference in erosion from the rock-lined shore to the exposed coastline. We have lost at least a meter, (3 feet) of coastline in this area. 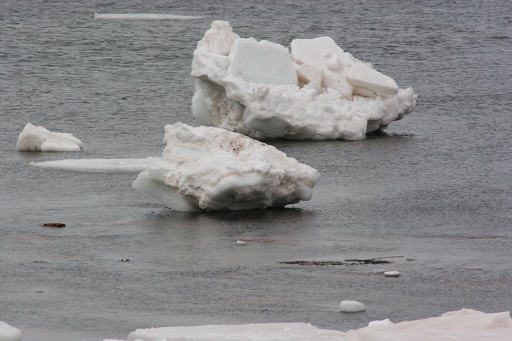 The provincial government estimates that we lose from .3 to 1.5 meters, (1 to 5 feet) of coastline annually. It appears that we are in the upper range of that estimate in this area of the shoreline. The rate if erosion is alarming. 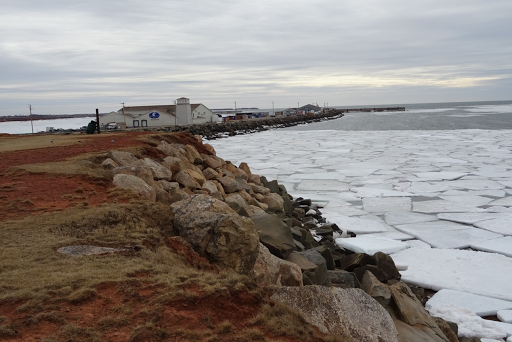 In Summerside, Prince Edward Island, we rely on groundwater for our water supply. 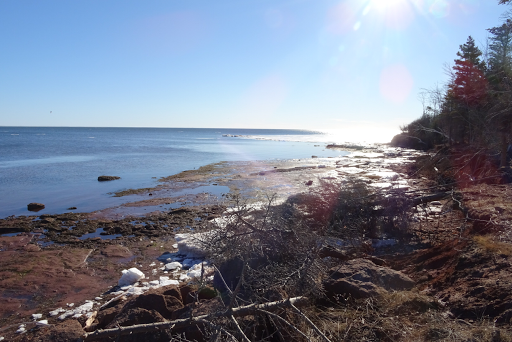 Our little city is on a small stretch of land between Northumberland Strait in the south and the Gulf of St. Lawrence to the north. Erosion can cause intrusions of salt water into the water table. Two wells have been lost to salt water already. Erosion poses a threat to our water supply. The armour stone has helped prevent further salt water intrusion into the water table as well. Our island is very flat. Models showing the effects of rising sea levels due to global warming show our island submerged. While we will not live to see this happen, this island is home to our granddaughters. What are we leaving for them? It is frightening to consider.